Whether you know it as Johannesburg, Jozi or eGoli (the Place of Gold), South Africa’s largest city is a year-round destination with pros and cons to every season. In terms of weather, the best time to visit Johannesburg is from May to September when the days are cooler, drier and sunnier than they are in the peak of the southern hemisphere summer (December to February). Summer also draws festive holidaymakers to Joburg in droves, sending accommodation prices sky high. Therefore, March through November is a cheaper and less crowded time to travel. If you’re interested in Johannesburg’s cultural side, you may want to schedule your trip around one of the city’s many annual events or festivals instead. Read on for our season-by-season recommendations. Johannesburg’s southern hemisphere location means that its seasons are opposite from what visitors from North America and Europe are used to. Summer lasts from December to February and is characterized by hot days, frequent afternoon thunderstorms and plenty of rain. Winter (June to August) sees mild, dry days with abundant sunshine and chilly nights. Having said that, Johannesburg is rarely cold by northern hemisphere standards. The last time it snowed was in August 2012 and it was enough of a phenomenon to make national news. If you plan on traveling in summer, make sure to pack your sunscreen as Johannesburg ranks highly on the international UV Index. Despite the fact that weather-wise, the best time to travel is from May to September, Johannesburg is at its busiest in December and January. At this time, schoolchildren have broken up for their long summer holidays and people travel from all over South Africa to celebrate Christmas and New Year with their families. At this time, hotels, restaurants, tours and domestic flights are all more expensive and top Johannesburg attractions like Gold Reef City and Constitution Hill are at their most crowded. South African schools also have holidays around Easter time, towards the end of June/beginning of July and around the last week of September. Dates change from one year to the next, so check the official school calendar before booking your trip if avoiding crowds is a priority. Because most overseas visitors limit their time in Johannesburg to transfers in and out of O.R. Tambo International Airport, the city is not as busy during the northern hemisphere summer holidays (June to August) as other South African destinations. Summer is the hottest and most humid time of year in Johannesburg with average maximum temperatures of 79 F/26 C in January. January also sees an average of 4.92 inches of precipitation, making it the wettest month as well — although rainfall is usually confined to brief afternoon showers. This is peak season in Joburg and you should make sure to book accommodation and tours well in advance. On the plus side, the soaring temperatures provide a welcome respite from the northern hemisphere winter and the atmosphere is decidedly festive. Keep an eye out for Christmas markets and events as well as a full spectrum of New Year’s Eve celebrations. Public holidays include December 16 (the Day of Reconciliation), December 25 (Christmas Day), December 26 (Boxing Day) and January 1 (New Year’s Day). Afropunk Festival is held every year on December 30-31 at Constitution Hill. A celebration of music produced by black artists, the festival started in New York in 2005 and has since expanded to locations all over the world. Johannesburg International Mozart Festival is typically held in January and includes a full week of classical concerts and cultural events. Fall in Johannesburg is defined by near-perfect weather. It’s drier than summer and warmer than winter — although temperatures vary greatly as the season progresses, with average maximums of 75 F/24 C in March to 64 F/18 C in May. To be on the safe side, pack for warm days and cooler nights. Shoulder season rates also mean you’ll be able to save money and attractions are far less crowded than they are in summer. This is also the season with the most public holidays including March 21 (Human Rights Day), April 27 (Freedom Day) and May 1 (Workers’ Day). Good Friday and Easter Monday are also designated as public holidays, although Easter Monday is known as Family Day in South Africa. The run-up to Easter is usually full of farmers’ markets and open-air concerts and you’ll be able to join the locals in making the most of the last warm weather before winter. Ultra South Africa is Africa’s largest electronic music festival. Held in March at the Johannesburg Expo Centre, it lasts for two days and has a sister event in Cape Town. The Rand Show is a Johannesburg institution with over 125 years of history. The lifestyle expo is held over 10 days in April and includes everything from fairground rides and fashion shows to military displays and cooking competitions. Winter is the coldest time of year in Johannesburg with average maximum temperatures peaking at 61 F/16 C in July and average minimum temperatures plunging to 41 F/5 C at night. However, this season is also the driest and sunniest, crowds are at an absolute minimum and you’ll pay low season rates for hotels and other amenities. It’s a great time to travel for those on a budget and for anyone who doesn’t like heat or humidity. Public holidays for this season include August 9 (Women’s Day) and June 16 (Youth Day). Youth Day marks the anniversary of the Soweto Uprising of 1976, when apartheid police opened fire on protesting students in the Johannesburg township of Soweto. As such, it’s a particularly poignant time to visit apartheid landmarks including the Apartheid Museum, Mandela House and of course, the Hector Pieterson Memorial and Museum. Encounters Film Festival is held in June in Cape Town and Johannesburg. For over 20 years it has showcased the best prize-winning and award-nominated South African and international documentary films. Good Food & Wine Show is Africa’s largest culinary event. Usually held in July, it features gourmet food stalls, cooking demonstrations by celebrity chefs and wine tastings with top sommeliers all based around a common annual theme. 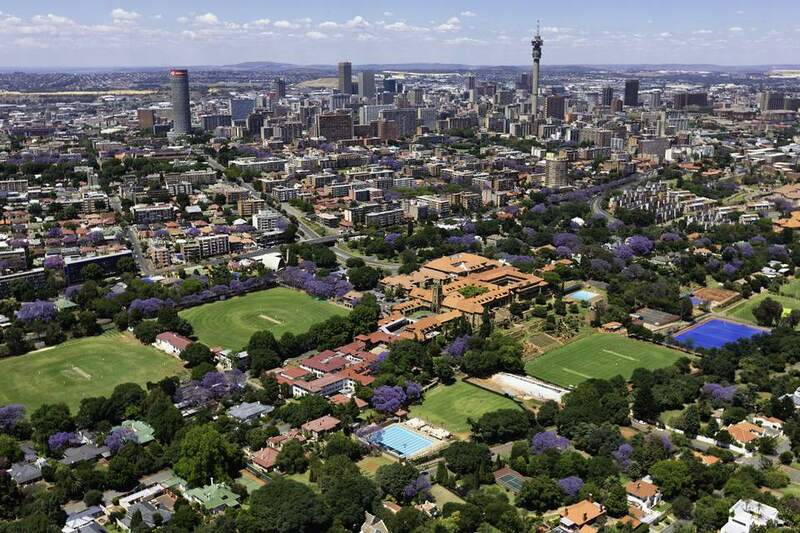 Spring is a beautiful time to visit Johannesburg because it coincides with the annual flowering of the city’s jacaranda trees. The best places to see the purple blooms include Munro Drive in Houghton and Jameson and Victoria Avenues in Melrose. September and October are also prime months for game-viewing in nearby Pilanesberg National Park because natural water sources are depleted, causing animals to gravitate to the waterholes where they’re easier to spot. The weather gets increasingly warm and wet as the season progresses. While September sees an average of 1.06 inches of precipitation, November sees an average of 4.61 inches. If you’re traveling towards the end of spring, make sure to pack a raincoat. There is only one public holiday: September 24. Although it’s officially Heritage Day, many South Africans regard it as Braai Day — an excuse to fire up the grill and invite friends and family over for steak and boerewors. FNB Joburg Art Fair is held in September at the Sandton Convention Centre. It’s a weekend-long extravaganza of contemporary art including exhibitions, lectures, performances and workshops. Soweto Festival is another highlight on Joburg’s September calendar. Located on Walter Sisulu Square in Soweto township, it is a celebration of South African culture with everything from wine tastings and food demos to stalls selling local fashion and crafts.